SO, you know what I still continue to find incredibly uncomfortable after two+ years? Telling people about what it is I do. It’s like “Oh hey, I write a food blog and I spend all day cooking. Yes, all day.” It’s the weirdest most awkward thing. What is even worse is when my mom tells people…in front of me. It’s typical mom stuff that all teenagers dread. Only thing is, I am no longer a teen (WHAT?? how is this possible?) and it still gets me every time. But really, my mom is the worst of the worst. I mean, she’s the best, but she is also the best at talking about her kids, and oh my gosh, I am so embarrassed about it. My little brother, he loves it. Me? Not so much. I don’t care how much success I have (or don’t have…she tends to exaggerate things) I am just not into people talking me up or talking about me period. PLUS, you just get these blank stairs like. “huh, you write a food blog? And that’s all you do? Can we trade places?”. Maybe someday I will come up with a none awkward way to inform people of what I do, but at my current age of twenty-one my shyness and insecurities still shine through. So basically, I am an awkward mess when talking about um, me. Fun, right? The only reason I bring this all up is because Asher had a new friend over the other day and the kids dad got the low down from my mom. Uncomfortable. My cheeks were redder than Santa’s coat. You see, I am still a kid at heart in some ways. Also, you’ll know I am feeling nervous/embarrassed immediately. I have cheeks that flush at a moment’s notice. It’s quite a talent actually. 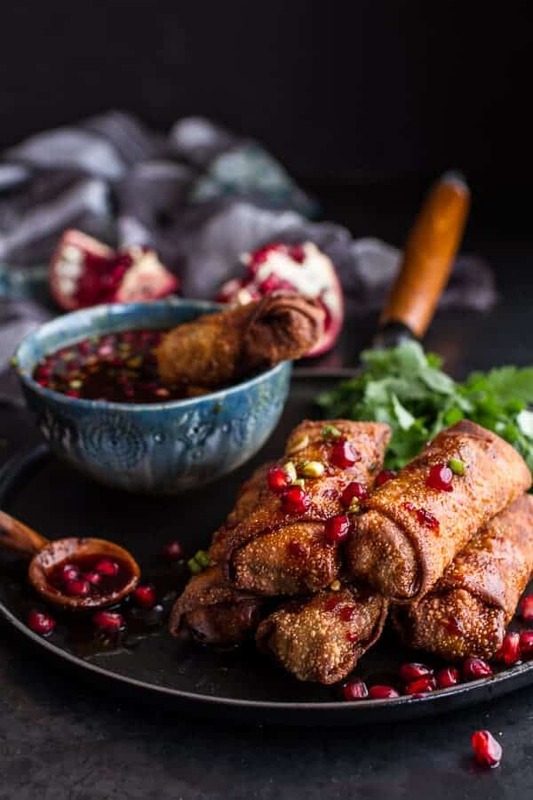 And now that we have all realized what a basket case I am, let me tell you about some egg rolls with sweet chile pomegranate sauce – before I completely lose you all! If you have never made homemade egg rolls, now is the time to do so. There is something about December that makes me think Chinese food and I have this feeling I am not alone. Again, I have no idea why I have this feeling, but I do. It seems that I like to make egg rolls in December. I did it last year and I am pretty sure I did it the year before too. This year though, I put my own spin on them. Typical me, I can’t let anything be. Please do not get freaked out that I put brussels sprouts in these instead of cabbage. See, brussels sprouts are really just mini cabbages, but with more flavor. Flavor I personally cannot get enough of. So good. I kind of added a ton of mushrooms too because lately I’ve been addicted to those as well. I guess these are good things to be addicted to. Health food. AND you can either fry or bake these. I fried them because I am turning into a frier (SCARY). Don’t know why, but I am into it lately. BUT baked are just as delicious. 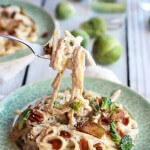 AND you can also use leftover turkey for these instead of the chicken. 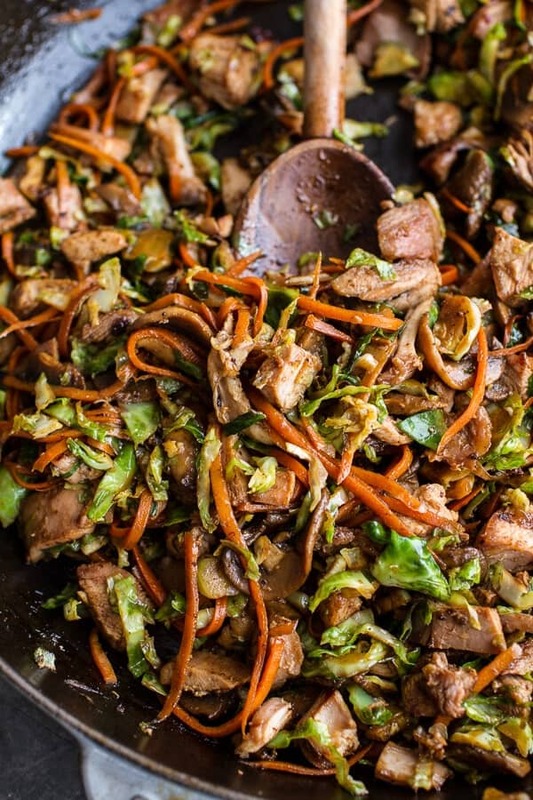 Just toss the cooked turkey with the marinade ingredients and cook in a skillet until caramelized. I actually did this on Thanksgiving. Worked awesome! You can’t make these though without the sauce. The sauce is so good. You really do need it, you do, you do. It’s spicy, but the sweetness of the pomegranates balances all the spiciness. Oh, and the pomegranates. These are actually a SERIOUS addiction. I still have more recipes coming your way involving pomegranates. Don’t get sick of them. Please, please, please. 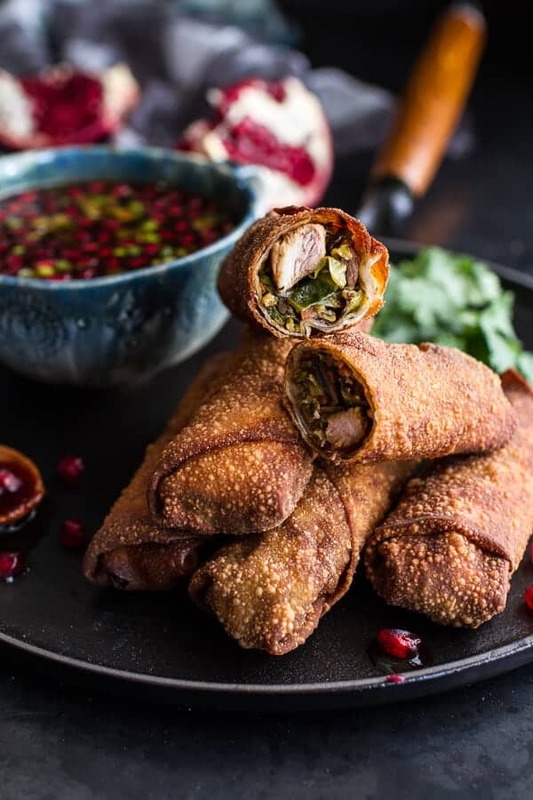 Thinking these will be the perfect “late-night everyone’s maybe had a few drinks (except me because I am so lame and still haven’t even used my new ID at the liquor store yet), let’s talk all night and eat up all the egg rolls with extra dipping sauce” kind of recipe. Yup, perfect for that. I can already see my cousins Abby + Maggie smiling and getting excited. Oh, and if I could keep your attention for hours, I’d tell you this ridiculous story about the day I made these, but maybe I will save that for tomorrow. 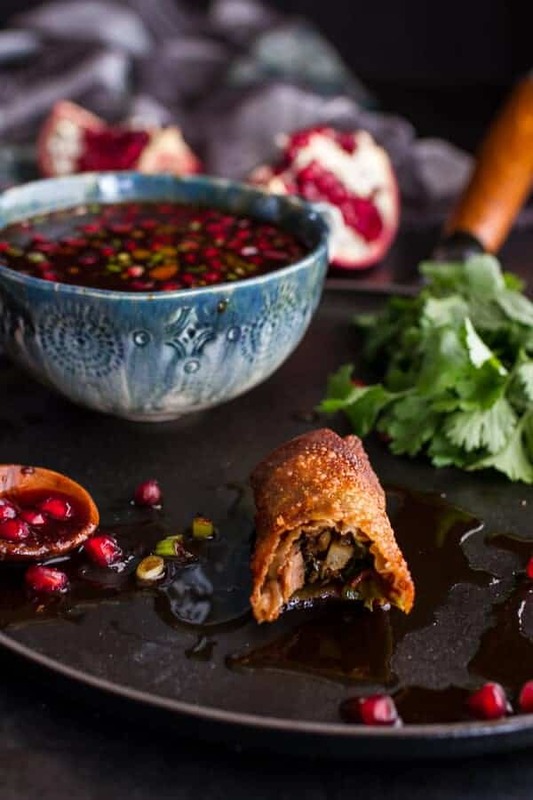 To make the filling, combine 3 tablespoons soy sauce, 1/2 tablespoon fish sauce (if using), 1 teaspoon hoisin sauce and the Chinese five spice powder. Add 1 clove of minced garlic, the ginger, 2 green onions, and 1 tablespoon sesame oil in a Ziploc bag or bowl. Shake well to combine. Place the chicken in the bag, press out the excess air, and seal. Refrigerate and marinate for at least 30 minutes, or up to 3 hours. Heat 2 tablespoons of sesame oil in a wok or large skillet over high heat. When the oil is hot, add the chicken + marinade (being careful of splattering) to the pan and cook until the chicken is cooked throughout and lightly browned, about 4-5 minutes. Transfer to a plate and set aside. Add the remaining tablespoon sesame oil to the pan. 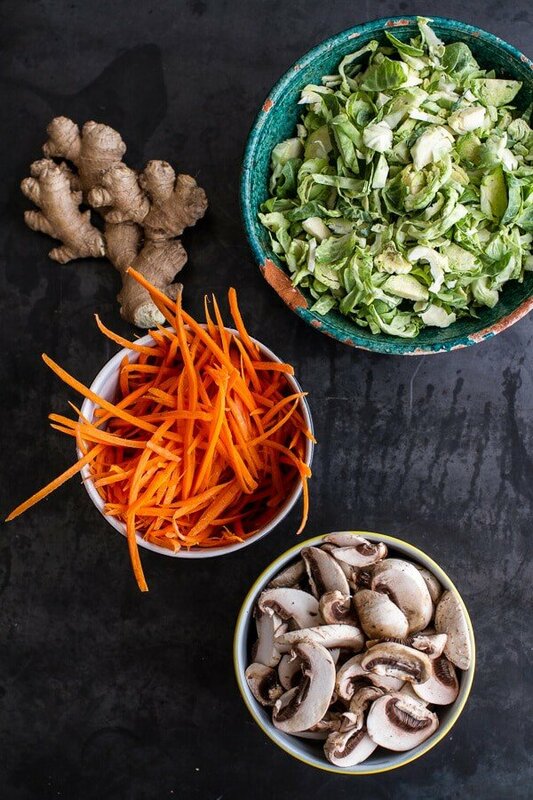 Add the shredded brussels sprouts, carrots and mushrooms. Add the remaining tablespoon of soy sauce, fish sauce and remaining teaspoon of hoisin sauce. Stir to toss the vegetables. Cook over high heat for about 8-10 minutes. Toss in the remaining garlic and green onions and cook for 1 more minute. Stir the chicken into the veggies. To wrap the egg rolls, lay an egg roll wrapper out on your work surface with one corner pointing toward you. Add a tablespoon or two of the filling to the center of the wrapper. Fold the corner closest to you up over the filling. Roll slightly away from you then fold in the two outside corners, and continue rolling the wrapper tightly away from you. Securely close the egg roll by lightly brushing the inside top corner of the wrapper with the beaten egg. Repeat with the remaining wrappers and filling. To fry the egg rolls, heat about 3 inches of oil to 375 degrees F. Fry a few egg rolls at a time in the hot oil but without overcrowding, about 4-5 minutes or until golden brown. Transfer to a large plate lined with paper towels to help drain the excess grease. Repeat with the remaining rolls. To bake the egg roles, preheat the oven to 425 degrees F. Spray tops of egg rolls with cooking spray. Bake for 10-15 minutes or until lightly browned. In a small to medium size pot, combine the sweet thai chile sauce, soy sauce, pomegranate juice, brown sugar, rice vinegar and ginger. Bring to a boil and cook for about 5-8 minutes or until the sauce has thickened and reduced slightly. Remove from the heat and allow to cool 10 minutes, stir in the pomegranate arils. Serve with warm egg rolls. In the meantime, you should totally make these. 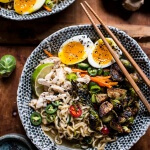 30 Minute Chicken Ramen with Miso Roasted Brussels Sprouts + Ginger Butter. NO big tips really. Just practice, learn what you like and try to take photos in natural light. Oh and learn you camera too, that helps so much! If you have any questions, just email me. Happy to help! OK get those young men to take you out and use that new I’D at least once–have some Christmas fun and then come back to the egg rolls–because those pictures really look good. If not have fun Christmas shopping. 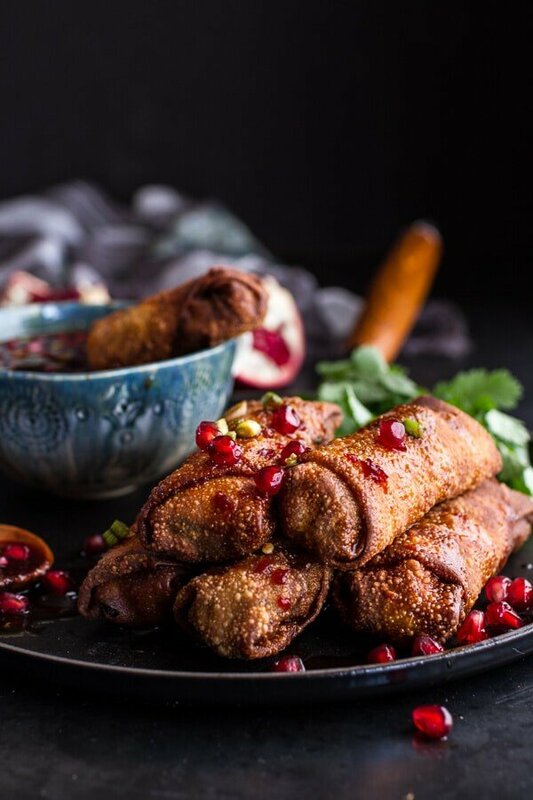 These egg rolls are GORGEOUS. I want to shove all the eggy rolly goodness in my face. These are my most fav pics of yours ever! Pinned! UGH. Yes, that is the worst. We work hard too! Wow these look so good…I love to make Chinese and Thai food at home it always tastes better to me and you get so much more for your buck. I will definitely give these a try and that sauce looks so good..I love to dip things. Thank you, Lisa! Hope you love these! I want you to know that your blog is way up there with the best, like smitten kitchen, and you are so young! Keep up the good work. 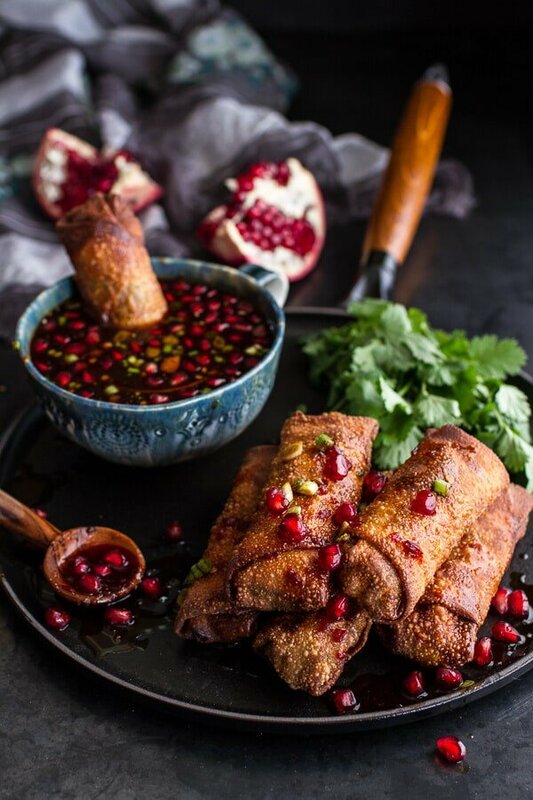 Please tell me, in the above recipe are you using pomegranate juice (like drinkable) or pomegranate syrup (similar to date syrup). WOW! Thank you so much! That is an incredible compliment, I am beyond flattered. You just made my week! I use pomegranate juice that is drinkable. Thanks again for all the kind words. Hope you love these! My mum is exactly the same. I work in biochemistry, she tells everyone I’m a doctor. A real medical doctor. I love my mum to pieces but have been keeping my blogging away from her. All I will hear is her tell people I’m a writer, who writes for . Oh well. Let mums be mums! I still find it so awkward to tell people what we do..they don’t quite understand! Then they ask how we can make a living off of it. My parents, husband and I actually talked about this last night. They don’t understand but they are all for me doing it! I know exactly what you mean. For a long time, my grandparents had no idea what to tell people. I finally had to just tell them, “I’m a food photographer and recipe developer and I have a blog.” Done and done. But it was funny to listen to them and realize they didn’t get it at all. I’m totally digging these egg rolls! And that sauce. Again, pomegranate anything is going to be right up my alley. So smitten with these egg rolls! Love the pom sauce!! I cannot wait to make the dipping sauce!! i have had the BIGGEST craving for egg rolls lately!!! these look amazing. 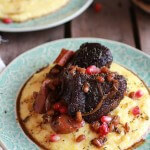 i love the idea of a pomegranate sauce!! The pomegranate sauce is the best!! BUT I just have to say that I still cannot get over your incredible Gingerbread winter wonder land. Mind blown! You know how you just can’t help yourself when it comes to your long recipe names (which I luv)? Well that’s how moms are, we just can’t help ourselves when it comes to our kiddos, no matter how old they are! I’m way past my teen years, and I still can’t handle it when my mom talks about me to others. I think that may be one of those things you don’t grow out of. And high-fives for being an insta-blusher…I’m the same way – even my neck turns red. Emotions on sleeve (or neck), I tell ya…emotions on sleeve. Anyway, these eggrolls are straight up killing me, and it’s making me want to fry allll the foods! UGH, beautiful girl! Nice to be insta-blushers together! Can’t fault mom, she’s proud of you–and validly so. But yes, I know what you mean, Matt’s mom is always bragging about us and that I just want to crawl into a hole. The eggrolls – nice job!! Haha! You too are totally something to be bragging about for sure though! 🙂 But I love the crawling in a hole idea, that is me! Hey Sarah, you can freeze these, just make sure to freeze them first on a sheet pan so none of the rolls are touching. Than just transfer them to a freezer safe bag. Hope you love these and let me know if you have any other questions. THANK YOU! Hope you are having great week! 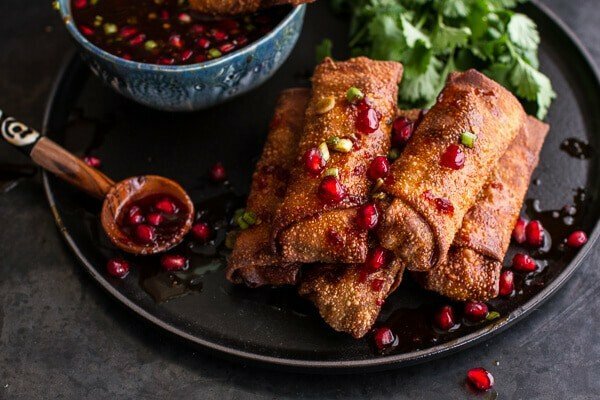 These egg rolls look insane! I’ve never made my own but now I want to. I feel the same about the blogging thing. It took me months to tell my colleagues at work that I am a food blogger but also because I don’t blog full time I just tend to not tell people. I know-silly. You are not alone, Tieghan. Thanks so much and glad to know it is not just me! I love pomegranates, especially this time of year! And I could drink that sauce. Seriously yumm! From one major blusher to another, I feel your pain. I’m told it’s charming, but I’m not so sure. 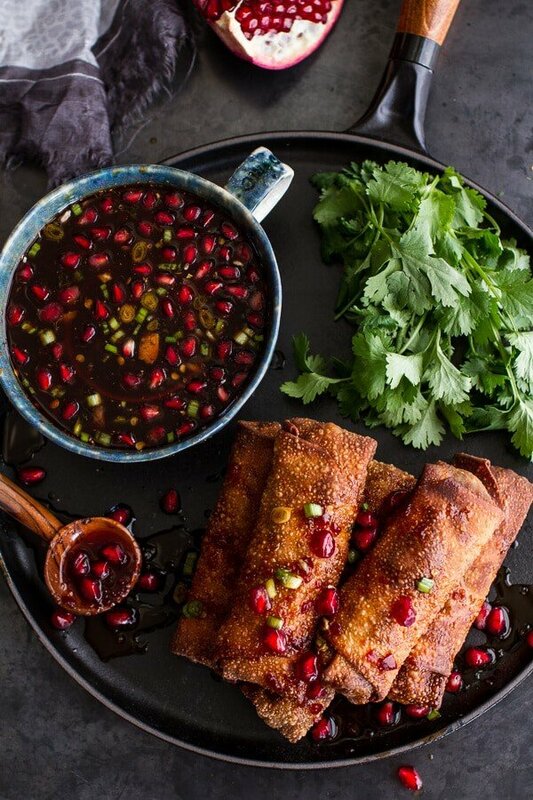 😉 Love this recipe, I’d basically eat anything in egg roll form! These look so good Tiehgan, love the colors too! Great photos! That looks so good and I bet it taste delicious. I really enjoy seen all your creations. 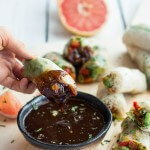 These look so delicious, I love brussel sprouts, never thought to put them in an egg roll. What a great idea! I have a dumb question. How do you shred Brusse sprouts? Food processor? Hand grater? Knife? Any of those options will work. I just use my knife, but a food processor will be much faster. Hope you love these! These were amazingly delicious! A kid ate all the Pom arils before I could make the sauce. Sigh. C’est la vie. The final product was still delicious and beautiful so I let him live. I will make this again the next time the desire to fry hits me. But I’ll hide the pomegranates. Thanks for the recipe! Love your site. I love your site and your recipes, but I wanted to take a moment to comment on the advertisements. While I understand that you are attempting to make a profit from your site, you should be aware that the advertisements are actually interfering with my ability to utilize your site. There are a total of NINE ads running on this single page, and four of those are animated and/or constantly cycling through pics. This had lagged my one-year-old computer up, and made it almost impossible for me to enjoy the site without frustration. Thought you would want to know how much this is frustrating me, as a patron of your site. Made these tonight and they were SO GOOD!!! 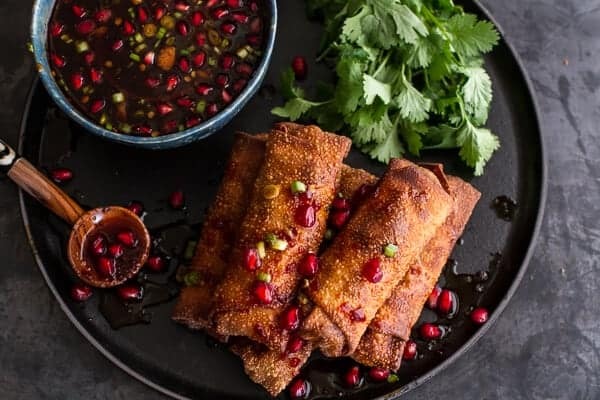 We ended up putting them into flour tortillas instead of egg rolls since it was one less step for us but the chicken mixture was so intensely flavorful, and then we added the sauce on top… YUM!! Added a bit of rice to the tacos to extend the meal a bit and it was phenomenal. Will make again. Thank you for such an incredible recipe! SO happy you loved them, THANKS! I baked them brushed with Olive oil. You are so talented. Can’t wait o try more of your recipes.